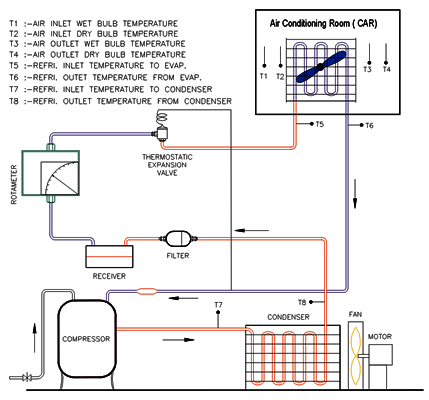 To study all components used in Automobile Air Conditioning system. To determine the Refrigeration Effect, Work Input, Actual C.O.P., Carnot C.O.P., Theoretical C.O.P., Relative C.O.P. and Ton of Refrigeration. Compressor : Compressor with external motor. Evaporator : Copper Coil evaporator with blower. Air is forced flow over the evaporator with the help of blower cooled before distributor. Expansion device : Constant pressure expansion valve. Pilot pressure operated throttling valve. Switches : For compressor, condenser fan, blower & air heater. Thermostat : Ranco or equivalent.